Facilitating Change for Excellence . . .
As Organizational Effectiveness consultants, Kells Associates bring in-depth and diverse experience to the consulting partnership. We pride ourselves in facilitating a successful, collaborative process while delivering promised results. We first meet with you to envision the goals you want to achieve for your initiative. Using one-on-one interviews, focus groups, and online survey instruments, we assess your current situation and report back clear objective findings. 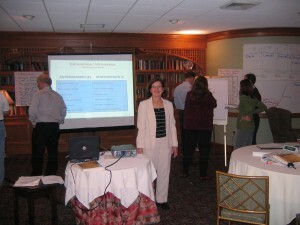 We lead planning and strategy sessions with key stakeholders to help you determine the best approach for your project. We facilitate on-going meetings and work with you to ensure project time-lines and quality deliverables are met. We facilitate problem-solving sessions to overcome barriers and stimulate new thinking. We evaluate the ongoing success of the project and put strategies in place to keep it dynamic and results focused. We ensure that you achieve your goals!